Today Mrs Kader,at the Catholic University “Sacro Cuore” in Milan, partecipated at the presentation of the book “The Church in Iraq. History, development and mission, from its beginnings to the present day” (Libreria Editrice Vaticana) written by Cardinal Fernando Filoni currently Prefect of the Congregation for the Evangelization of Peoples, who combines his interest in history to the experience he lived when he was nuncio in Baghdad during the war in Iraq in 2003 and to his current duties as Prefect of Propaganda Fide. Attending the meeting the Dean of the Catholic University, Franco Anelli, Sen. Pier Ferdinando Casini, President of the Foreign Affairs Committee of the Senate of the Republic, the Director of "Corriere della Sera" Luciano Fontana and two professors of the Catholic University, Agostino Giovagnoli and Elisa Giunipero. The book, Dean Anelli said, is an historical overview of more than twenty centuries of Christians presence in Iraq thanks to the extensive knowledge of this area by Cardinal Filoni as special envoy of the Holy Father since 2014. This volume, continuing the two professors of the Catholic University, is the first attempt to collection the complete history of the Christians presence in Iraq, bringing out a deep admiration for them by Cardinal Filoni and the role of a church with a strong theological tradition. Senator Casini spoke about a fundamental testimony that describes the path of a heroic church that is facing enormous difficulties, in those country (Iraq and Syria) where there was great respect for the value of secularism and so they have become targets of Isis terrorists. The book also shows, continued the Senator, the serious historical responsibilities of the West that led to the current instability, although the Kurds, who are the only force able to creating the conditions for future stability. Cardinal Filoni thanked the present for their hospitality and the words they expressed for his book, that wants to be a starting point for reflection on the glorious history of the Church and Christianity in general and a landmark of memory and study for the Chaldean Church also. The Christians of Iraq are an important part, not a minority, the cardinal said, mentioning the meeting with the President of Kurdistan Region Masoud Barzani, in which was reaffirmed the right of everyone to live in their own land. 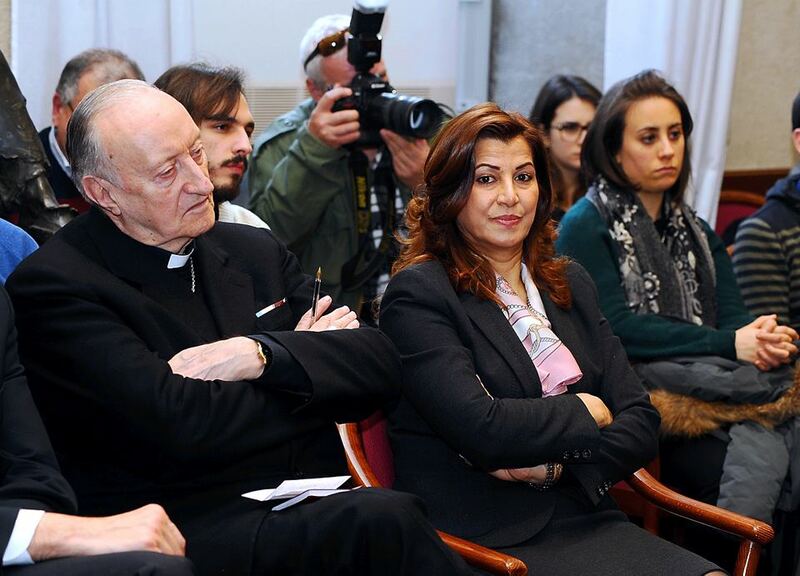 Cardinal Filoni also recalled his mission in the region with Mrs. Kader where he had the opportunity to visit the places of worship. The High Representative intervened pointing out that, in the Region, the term minority is not used, because Kurdistan is a peace mosaic inspired by the principles of ethnic and religious integration where all the components represented live in peace.